Charlie Bates Quartet at the Corner Pocket Jazz and Blues Club, June. Charlie on piano along with Tom Niblock on sax, Charlie Johnson on drums and Sam Ingvorson on double bass provided a thoroughly enjoyable evening of music based around the so-called Great American Song Book. Numbers featuring a band whose origins lie within the Birmingham Conservatoire, Jazz Faculty who in turn, were given full credit by band members for the fine work done on their behalf. This was a young band who played with maturity and imagination, delivering creative, fresh interpretations from each of the soloist's, when the occasion arose, and there were plenty of opportunities provided by leader Charlie Bates. Added to a string of well known numbers were diversions into compositions from Thelonius Monk and Kenny Wheeler along with Cynopsia taken from Charlie's recent CD "Silhouettes". The latter receiving a well earned plug on the Helen Mayhew, Jazz FM programme. A CD with rich and multidimensional compositions with reminders of the musicianship and wide ranging influences found in the work of Vince Mendoza, and all provided by youthful players from the Conservatoire. A truly wonderful evening arranged by Ivor, Neil and Steve with a promise of more to come when the George Cummings Quintet will be appearing on Tuesday 11 July. 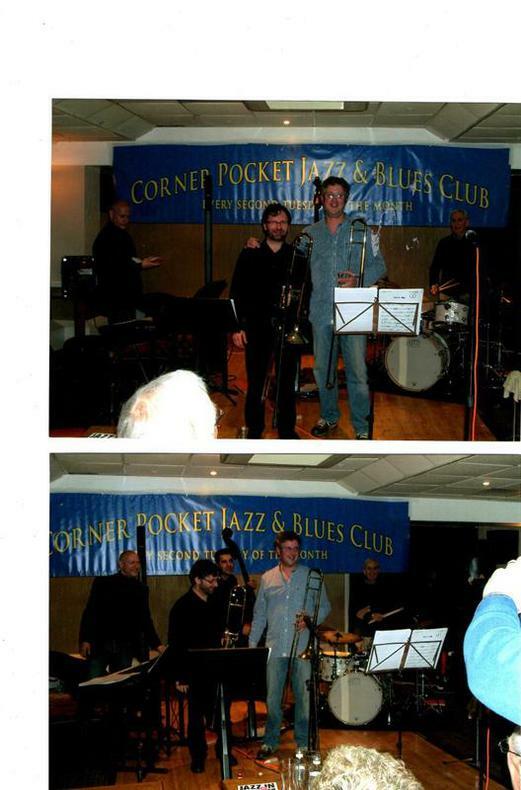 Corner Pocket Jazz and Blues Club, 11 October 2016. The Al Gurr, Ben Markland and Sam Rogers trio. 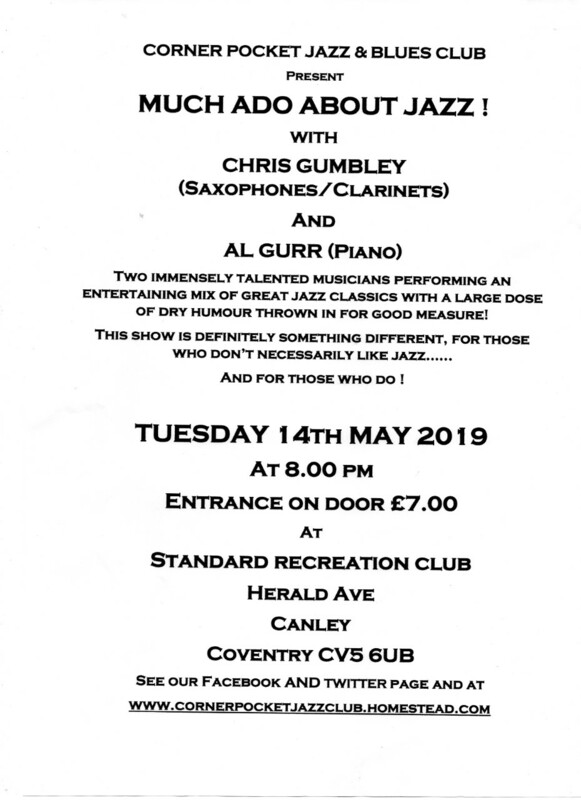 A thoroughly enjoyable evening spent with three musicians playing a mixture of standards, linking occasional references to Charlie Parker, Stan Tracey, Miles Davis and Toots Thielmans. Each player creating, individual and imaginative interpretations and clearly challenged to respond whether it be with sincerity, levity or on a few rare occasions with just the odd melancholy phrase. As ever, Ben provided sensitive treatment, especially to that iconic number "Song to my Father". One surprise being that Imogen, his very young daughter remained silent throughout the evening, although her voice will surely be heard at some future gig. Something else to look forward to. A well rounded programme made all the more memorable by the witty and amusing intro's by Al who we have come to respect not only as a keyboard player of the highest order, but who can also throw in the odd musical challenge. Allowing listeners to excercise their grey matter to reveal - or not, as the case may be, their depth of knowledge. Or maybe the respectful silence is linked in part, to the liquid refreshments dispensed inexpensively from the Club bar. Or could it be that Pocketeers were simply thirsting for even more from this trio. No doubts about that. With this being only the second appearance of Sam at the Corner Pocket, we listened to another player of the very highest order. Thanks to everyone who helped make this a memorable evening. Elvet Bridges. The Ben Holder Trio provided another wonderful night of jazz at the Corner Pocket. Ben leading on violin. The programme ranged from the expected influences of Django with Ben demonstrating his own creative interpretations of "Fascinating Rhythm", "Ain't Misbehave'in" and many more, through to a very topical treatment of Dave Bowie's - "Life on Mars". On keyboards we had Tom Kincaid who's medley of Gershwin solo's, introduced some like myself, to a musician who I look forward to hearing more of, in the future. Supported by Paul Jeffries, on double bass. Imaginative, understated backing, a joy to hear, especially when combining with Tom. Two quite outstanding players. This gig was nothing if not varied with Part Two being focused on the music of Benny Goodman. To which was the added surprise of having Ben give a rendition of his very own romantic composition "You," Along with his other vocals, perhaps there were fleeting moments when here, in our midst, was a young man who like Chet Baker, could capture an audience with numbers delivered with great feeling and sincerity. What's more, and when called upon, Ben can even sing in French ! This was an evening of variety and sheer enjoyment. Thanks to all who made this memorable evening possible. And for something completely different, the Consortium Big Band will be playing on 9th of February. Their theme will be "Time and Space" - so, be prepared to be taken on a journey well away from the the wet and windy weather of late. Be There ! 8th September 2015 - England 2 Switzerland 0, Corner Pocket 3 ! Not as many as those at Wembley Stadium but the Clubbers were entertained by the Phil Bond Trio whose repertoire was every bit as varied and enjoyable as anything displayed by Rooney et al. With Phil on piano and in fine voice, complimented by Howard on drums and Mike, a true master on double bass whether supporting or playing a solo. Wonderful musicians who treated us to a varied programme designed to please even the most discriminating and demanding. Half time was far too long with players of this calibre on the pitch ! So the second set kicked off with "Hold it right there" before the trio gave us "A New York state of mind", followed by a sharp reminder of days of yore with Bill Haley hits before driving down the half way line with Honky Tonk Train Blues. That set many a foot tapping before the trio switched to Latin numbers. Was this to serve as a nod towards the need to practice a few steps in readiness for the Autumn Swing Dance on 20th October ? Looking for a partner perhaps ? Then Phil offered a careful reminder from Nina Simone's "My baby just cares for me". Be warned ! And as if to add to Nina's warning, we heard Duke Ellington's "Prelude to a kiss". Phil's rendition of Herbie Hancock's "Dolphin Dance was as fresh, as the date it was written and a gentle reminder of a piece, often overlooked. Then on to Chick Corea's "Five hundred miles high" This was a programme diverse, and worthy of a Five Star Michelin restaurant served by masters of their chosen instruments. The guest beer on draught was Harvest Gold so it it was only natural that the trio should upgrade their final number to "Champagne Illuminations" as a tribute to the eponymous Ivor. Come 20th October - Be There, and bring a friend ! It never fails to amaze me as to the quality of the musicians playing at the Corner Pocket. 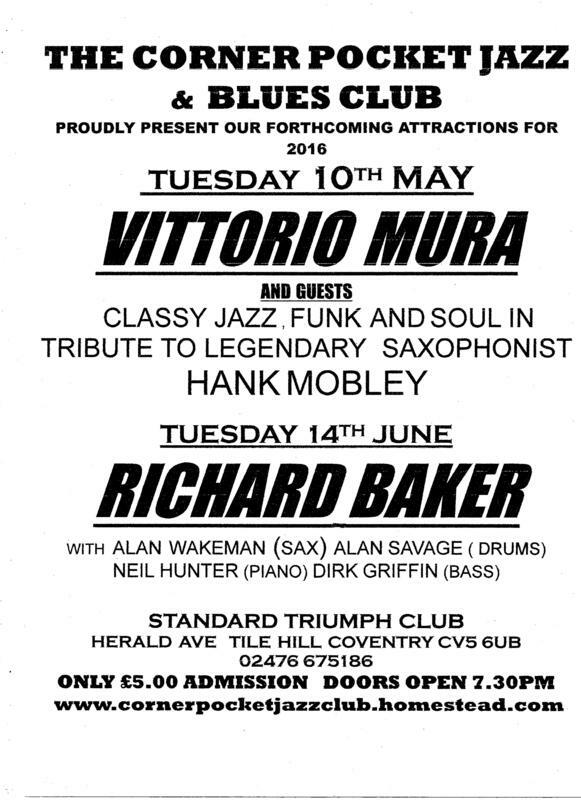 The Al Nicholls gig was memorable and introduced me to a tenor player who I look forward to hearing again and again. 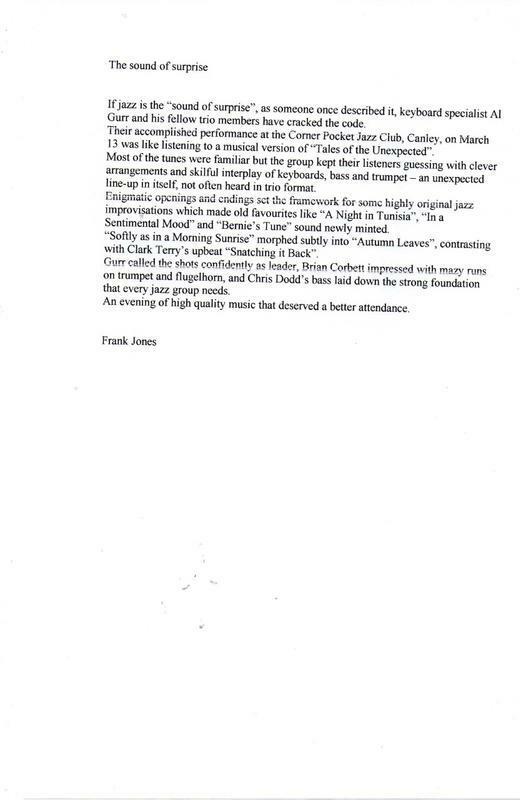 What a shame that so many missed an exceptional evening of jazz. The Consortium Big Band always provides an enjoyable evening, leading all supporters towards the June offering of Midsummer Swing. A very special date for the diary ! Only one problem, finding a partner who can tolerate my long neglected dance steps ! But "hope springs eternal" !! When I learn, with regret of less than optimum support, I wonder why this is ? Perhaps it is because that at £5/head, those on the fringe cannot believe that at such a such a low price, it can be anything other than mediocre performers trying to earn a crust. Nothing could be further from the point. Each month, we enjoy playing by truly world class musicians. All concerned deserve the highest of praise for providing jazz in all its forms at exceptional levels. 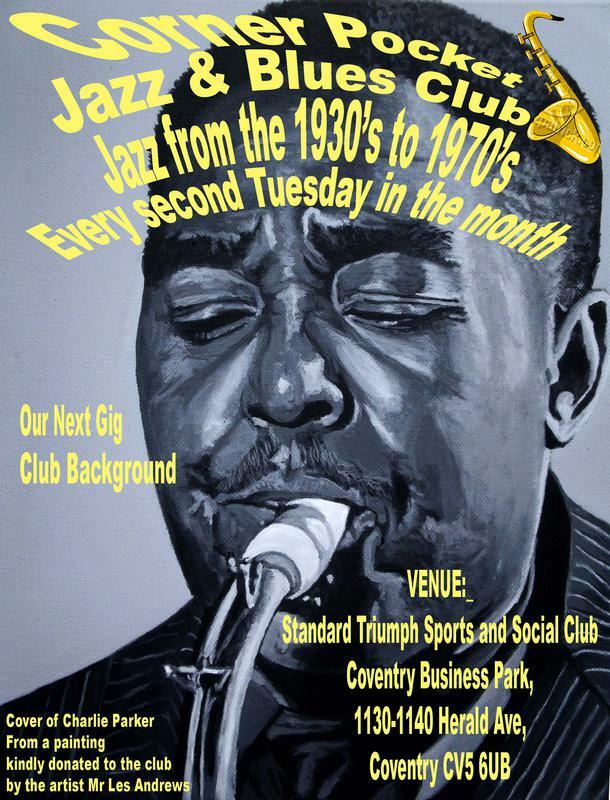 All that I can say is that we are fortunate to live in Coventry and able to enjoy the entertainment that takes place due to the unfailing services of those people who organise the Corner Pocket Jazz and Blues Club. Long may it continue !!!. Lewis Hall.